Phase 3 failure generates lots of attention, since the investigational drug should have been fairly well-studied in phase I&II. This article has a good discussion about Phase III failures, its cost and how to “prevent” it: @appliedclinicaltrialsonline.com. Massive insider selling and U-Turn in drug efficacy makes me wonder about the integrity of insiders and what we could learn as vulnerable investors. Patients receiving the combination of Fovista and Lucentis gained a mean of 10.6 letters of vision on the ETDRS standardized chart at 24 weeks, compared to 6.5 letters for patients receiving Lucentis monotherapy. This represents a 62% additional benefit from baseline. No significant safety issues were observed for either treatment group in the trial. OPHT briefly popped on the news. 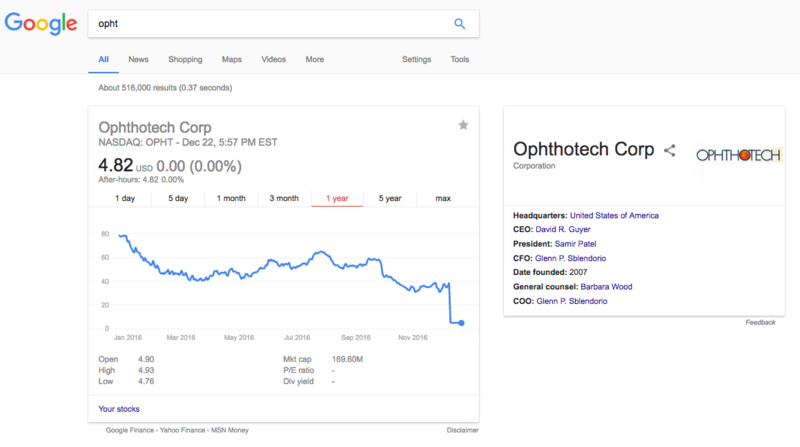 Ophthotech rises on positive mid-stage results. Why such a change in efficacy? The efficacy in control Lucentis arm turned from 6.5 in phase II to 10.x in phase III. Nothing happened in active combo arm, the change in control arm rendered the combo from very effective to completely useless. This article from SeekingAlpha summarized the history of press releases from the company. The author also raised the question about dramatic change in efficacy of control arm. Less than a year after OPHT’s IPO, in May 2014, it struck a 1B deal with Novartis to develop Fovista. Novartis hoped that this new combo could rescue Lucentis’ falling sales due to competition from Roche and Regeneron. However, since part of the combo and mono-comparator Lucentis is marketed by Novartis since 2006, shouldn’t Novartis have already known whether Lucentis’ efficacy was 6.5 or 10.5? It’s already in use for 8 years by then. Novartis didn’t care about their money. $330 mil upfront payment is only a fraction of its 13B cash. Novartis only cared about its commercial potential and blindly believed OPHT’s results without internal validation. Perhaps Novartis management didn’t even ask its scientists’ opinion. Novartis management is good friend to OPHT management. Whichever case it is, for us investors, it is sad that we invest in companies like that, and sad that we pay the management big money only to get disappointed. It is sad that the management at Novartis is NOT professional enough to protect investors’ money. And one major institutional holder: Novo Nordisk Holdings (probably a major early funder) cashed out $118mil since IPO. It sold all its leftover shares on 12.14-15.2016 for ~$5/share. Apparently Novo lost its last piece of faith in the company, if any, and decided to fold, with $118 mil cash in pocket. Other early funders also sold their shares in single transactions that each worths tens of millions dollars. The massive and consistent insider selling goes all the way since IPO lockup expiration. No buying at all. Any transaction labelled as “Buy” was option execution at very low price, and always followed by immediate “Sell” at market price. What should we investors do when every officer, director, funder and major shareholder is busy cashing out? I wonder if they have time running a proper trial if they were that busy in the stock market. This case reminds me one of Buffett’s four rules: a company with trustable management. If we don’t know the management in person, how do we judge whether they are trustable? All of the company’s PR news all have a very fishy, over-optimistic, cheerleading, handwaving, and magnifying tone. You know some liar is in play. Do they sell their shares like hot potato, cannot be fast enough for them? Do they keep missing milestones and deliver business failures and disappointments, which are still decorated with fancy languages? When these things happen, we cannot trust the management. 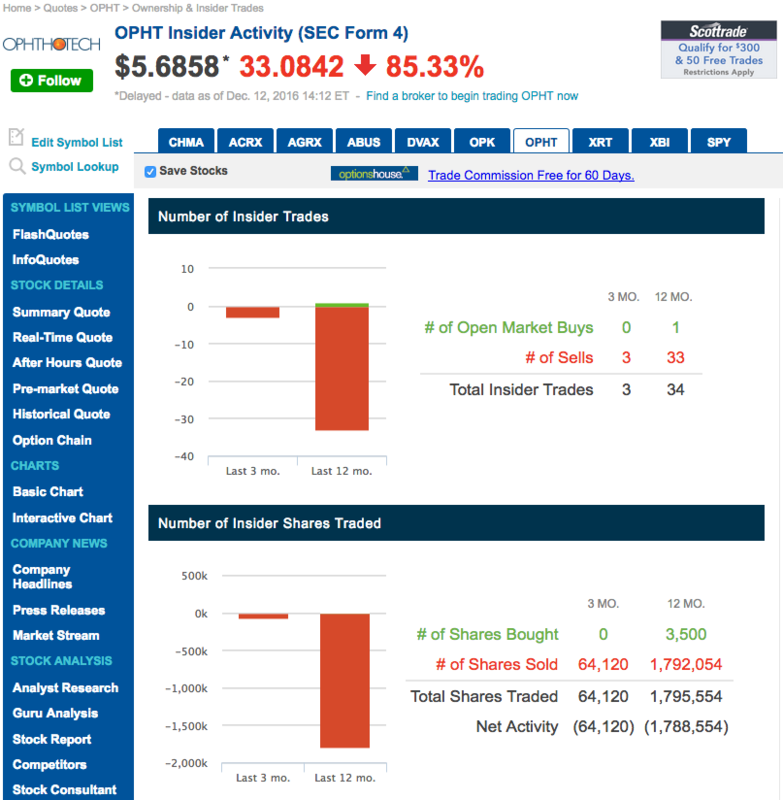 Dump the shares as fast as they are doing, if not faster. Another lesson I learned is, for this kind of one-trick-pony junior biotech, we have to buy it at very cheap price, preferably at or even below cash value. If success is already priced in, even if only 30%, the risk/reward is still not favorable. So, if you can still see value in anti-PDGF antibody in wetAMD or other indication, and if you still trust the management, you can get in now or in the next months. Intrinsic value of the antibody hasn’t really changed but share price is lower than ever. Unfortunately, I don’t understand either anti-PDGF or wet AMD. There are biotech companies that I understand better. Lastly, I feel sorry for the patients who particiapted in the trial. Disclaimer: I don’t own or plan to initiate any position in 72 hours on OPHT, NVS, Roche, or REGN.